Batterygate? Really? | Johns iPhone | iPhone Blog with Help, News, Tutorials, Tricks, Tips, and More! 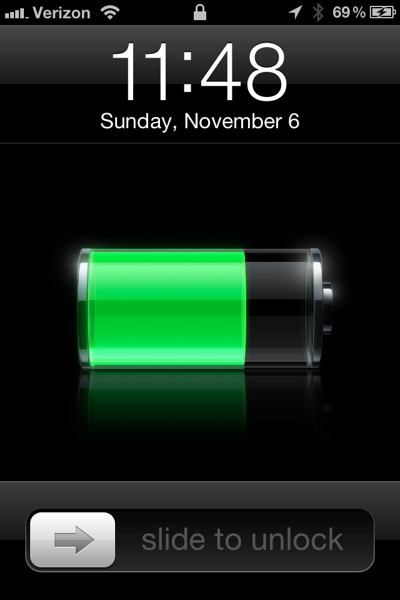 Home » App Review » Batterygate? Really? I find myself saddened yet again by consumers and their new toys. It would appear that every single years, no matter what, there is something that people will complain about. For every new gadget that appears on the market, there are millions of people that are perfectly happy with said product, and then there are the others. There is that small percentage that speaks out more than everyone else. That small group of people who have macrumors accounts and think they are invincible for it. This self proclaimed ‘battery gate’ is no different. Last year, it was ‘antennagate’ and Apple had to waste weeks of their time to research the issue only to find…that all phones have the issue. Is it preventable, yes it was, but for the most part, all cell phones did it. Yet, there was enough of an outcry that people got free cases, and an apology. That seemed weird to me last year, and it does again this year. I have had an iPhone 2G, iPhone 3G, iPhone 3GS, an iPhone 4, and now an iPhone 4S. They are all different phones, each one has it’s quirks, upsides, and downsides. They were all different for their time, and they were and are, all advancements for their time. And because they all took a step in a direction that no one else had ever taken before, they all found new issues that no one else had found before. But lets be honest, the original iPhone had the best battery life by far. I could leave that without charging it for days. The 3GS was easily the worst. I had a cable in my pocket 24/7. The iPhone 4 started out just as bad, but as the software got better, and we moved away from 4.0, it also got much better. Out of the box, the iPhone 4S has been the best since the original iPhone. Yes, iOS 5 does take a bit of a hit on the battery life, as does the dual core A5 chip, but for me, the phone still lasts all day without me having to charge it. That was something I could say about my iPhone 4, but only after numerous software updates had their way with it. We are still sitting on 5.0 software, and it works pretty well. So it doesn’t match the website perfectly, it doesn’t match expectations and predictions to the T. Thats ok! The phone still works amazingly. Better than most would have expected. Think of the other dual core phones on the market? Most of them can’t even last 4 hours. Battergate in my opinion is the biggest showing of ingratitude I have seen in a while. The software and the phone are brand new. Not even a month old yet, give it some breathing room and I am sure everything is going to work out in the end. Will 5.0.1 make the battery better? Yes I am sure, for most. For some, they are still going to be unsatisfied. And that, in my humble opinion, is a shame. It is a great phone, and more people should appreciate it for what it is. Pick your battles.